The High Bridge is the oldest remaining bridge in New York City. The bridge spans the Harlem River, connecting the neighborhoods of Highbridge in the Bronx and Washington Heights in Manhattan. First opened in 1848 as part of the Old Croton Aqueduct, the 1200–foot–long, 116-foot-tall High Bridge walkway first brought fresh water to New York City from Westchester County and fueled the city’s northward expansion. It was closed to regular public use around 1970. By 2014, the bridge will be rehabilitated and reopened for pedestrians and bicyclists thanks in large part to $49.7 million in funding from Mayor Bloomberg’s PlaNYC initiative. Additional funding from Congressman José E. Serrano was critical as well to move the $61.9 million project forward. The reopened High Bridge will be an essential link in New York City’s expanding waterfront Greenway. 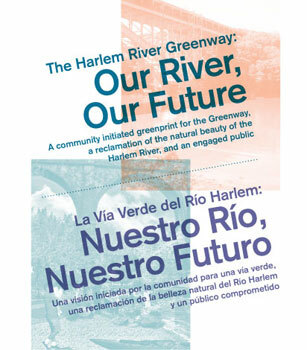 It will allow Bronx residents to reach the Highbridge Pool and Recreation Center, and Manhattan residents to reach the Harlem River waterfront. Planned improvements will make the bridge more accessible and safe. The rehabilitation will follow historic preservation principles to restore the architectural details of this landmarked structure for public enjoyment.